While I was traveling this summer I took along some hand piecing work. I cut a bunch of light and dark five inch squares from my green and blue scraps. I marked lines 1/4 inch to each side of the diagonal on all the light squares, then pinned each light square to a dark one (right sides together, of course). Then I hand pieced by sewing along the marked lines. Once the lines on both sides of the diagonal were sewn, I cut down the middle between the stitching and the result was two half square triangle blocks. After I got home i put the squares up on my design wall and arranged them until I had a pleasing pattern. I used a sort of expanding pinwheel pattern, but lots of other patterns are possible. Here is the resulting lap-sized quilt top. The finished blocks are 4 inches. I like the result and it was nice to have a portable handwork project along. Not very speedy, though. I probably could have done the quilt top in a day at home on the machine! 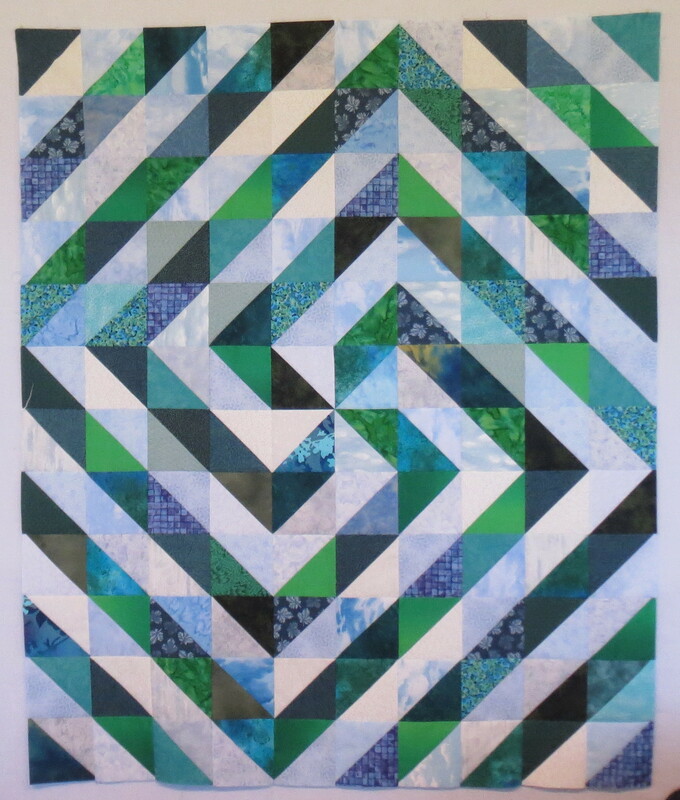 This entry was posted in Quilting on September 6, 2014 by Shirley at Mystery Bay Quilt Design.